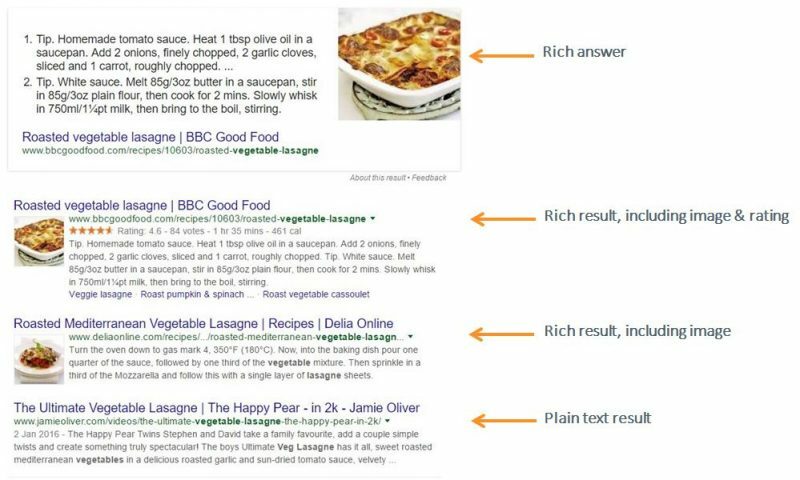 These are examples of Google using ‘rich snippets’ – snippets of content from web pages – to return what are known as rich results and the obvious benefit for businesses is that they stand out from simple text-only results. Below are the results for the query ‘vegetable lasagne recipe’. The top 3 listings contain some form of rich result; the 4th listing doesn’t, which demonstrates the impact of rich results on a site’s visibility and appeal. After all, which result would be most likely to click? We’ve also seen an increase in Google search results displaying rich answers – such as the first listing in the example above. A rich answer is the complete, direct answer to a search query that shows up at the top of your results. This is when Google uses external data to try to answer a query as fully as possible, without the user having to click any further. A study by Stone Temple Consulting found a 38% increase in rich answers in the first six months of 2015 and identified that Google uses external data (ie, not its own) for 75% of them. 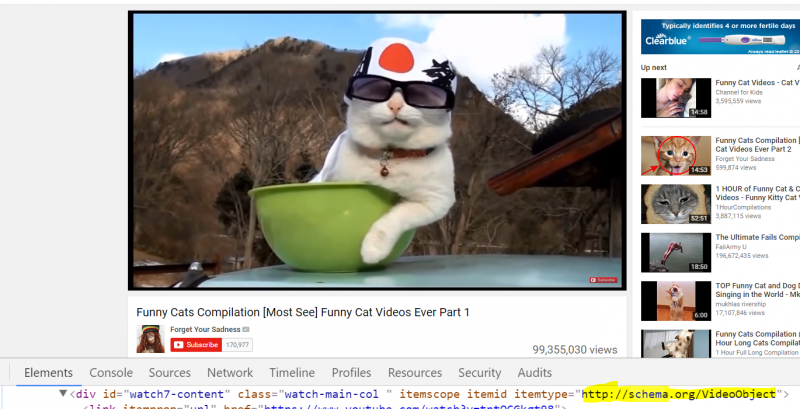 To make your content eligible for inclusion in rich search results, you need to use schema markup on your web pages. 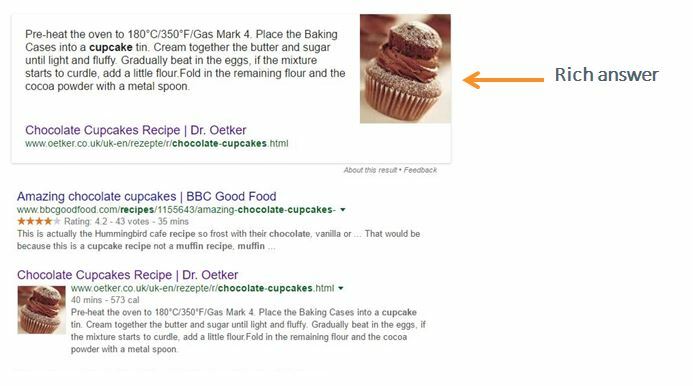 Schema markup is type of microdata standard used by Google to identify types of content on your website and display this data as appropriate when people perform searches. Search engines use this information to help determine the relevance of your website’s content to users’ search queries, boosting your organic search visibility. 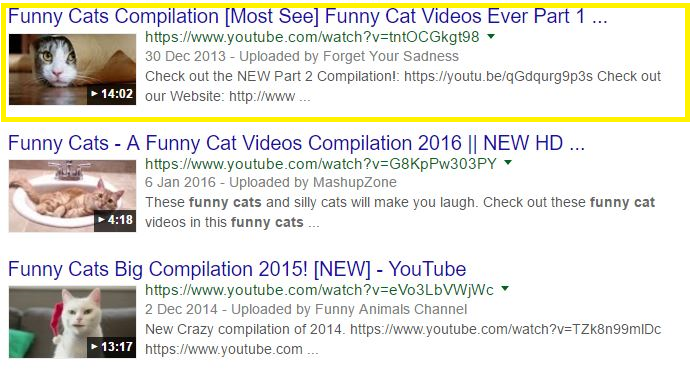 Since content is easier to interpret, it can rank higher in search results. 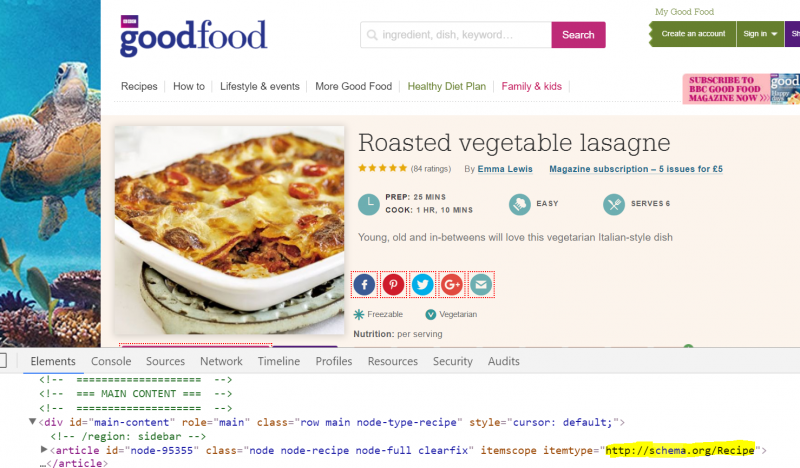 However, a study by Raven Tools last year that crawled over 200 million web pages found that a only 20% used schema markup – meaning they’re missing out on the benefits of being included in rich results. Schema.org is a collaborative, community activity that creates and maintains a standard, shared schema markup list for defined content types and subtypes and the code that people use to implement each type. Although Google has confirmed it doesn’t pay attention to schema for rich results purposes, we would still recommend ensuring your pages have the relevant rich snippet markup as best practice to benefit from the enhanced listings it could give. What types of rich results appear in the top spots for your keyword phrase? Do some research and focus on creating the kind of content people expect to find in Google searches. Aim to satisfy your audience’s interests and answer the kind of questions they’re asking. To increase your chances of being featured in rich results, focusing on long tail research into what your target audience searches for is even more crucial. Identify the questions they’re commonly asking and ensure your content not only provides clear, substantial answers, but also includes the questions themselves. You also need to give users extra reasons to click through to your site, for example, mentioning additional resources they would find valuable. Want to increase your chances of appearing in rich answers? HubSpot’s Matthew Barby has carried out in-depth analysis into the factors that contribute to ranking in a featured answer. Identify a common, simple question related to your market area, but offer value added info beyond the direct answer. Feature the search query in page header tags (such h2s and h3s). Provide a clear and direct answer to the question early on in the text (Matthew Barby recommends an optimum length of 54 to 58 words). As Google will often use the first paragraph of an answer as a rich answer, page structure is important. It goes without saying that it should be user-friendly and logical to navigate. The key message is the same as always when it comes to usability and rankibility: create high quality, relevant and engaging content with the human user in mind. We offer a range of organic search (SEO) solutions to help improve your brand’s visibility and improve the quality of your traffic. Request a no-obligation SEO audit by our experts today.